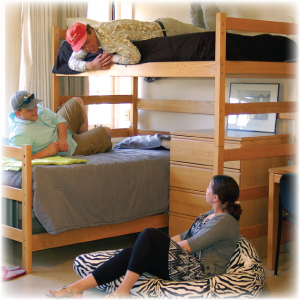 A variety of bed heights are available to students in the Residence Halls depending on which hall you live. Aber, Craig, Duniway, Jesse, Knowles, Pantzer, Turner, and the 1st-4th floors of Miller Halls have the choice of standard height, captain height, or lofted height. 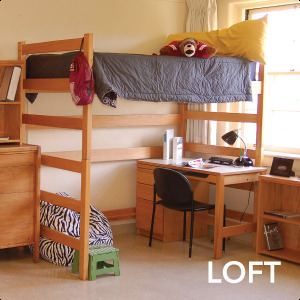 Miller Hall 5th floor offers the choice of standard or captain height, but not lofts due to ceiling height constraints. Select Elrod double rooms come with the beds pre–lofted at no cost to the resident and must remain that way to maximize the space within the rooms. Bed height change requests apply only to the Residence Halls and are not available in Lewis and Clark Village or University Villages. UM Housing does our best to have all bed height changes completed prior to when a student moves into the room. We recognize it is much more difficult and requires rearranging your personal belongings to change the bed levels after you have moved into your room. Due to this, our priority deadline for bed height change requests is August 1st, and costs $35.00. After August 1st, the bed height change charge is $50.00, and we can not guarantee the bed height change will be completed prior to your move into the room. Bed height requests must be submitted through myHousingPortal, and the additional cost will be billed to your student account. If you have any questions or want to make a change after submitting the original request, you must call the UM Housing Office at (406) 243-2611. If you choose to make a different change after the original request has been completed by our maintenance staff, please note that there will be another charge for the subsequent bed change. 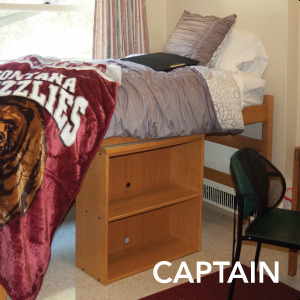 With the exception of captained beds in Aber and Jesse, safety issues preclude us from allowing the residents to adjust the height of their bed on their own. The bed changes must be made by trained employees of the University. 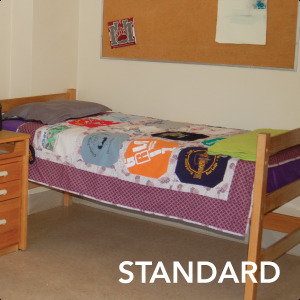 If UM Housing staff determines that a student has made their own bed change, we will inspect the bed to make sure it was properly installed, and the student will be charged a bed height change fee. Standard height does not need a request as the beds are at standard height automatically. At standard height, there is approximately 19.5 inches under the bed for storage. The mattress of this bed is located approximately 37 inches from the floor and gives you 31 inches under the bed, which is plenty of room for under the bed storage without the use of a ladder to get into bed. At this level, the mattress on the bed is approximately 66 inches from the floor and allows for the placement and use of a desk, easy chair, or loveseat (not a couch) in the 56 inches of space under the bed. This option is not available on the 5th floor of Miller Hall. The mattress on the bottom bed is approximately 29 inches from the floor and the top bed is approximately 66 inches from the floor. This leaves the floor space in the rest of the room available for desks and other furnishings and 19-1/2 inches under the bottom bed for storage. 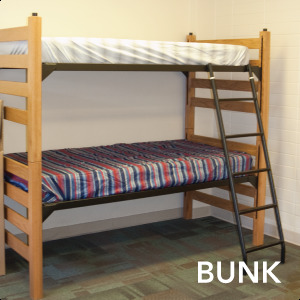 If requesting a bunked bed, please talk to your roommate. If you and your roommate decide to bunk your beds, both of you will need to call the UM Housing Office at (406) 243-2611 to confirm this request. UM Housing will not bunk beds unless both roommates request this option.